Summer is full of reading and stories: around a campfire, at the library reading program, in a book club, or in the paperback you toss in the beach bag. Whether you are reading the Bible, a picture book, news article or hearing a friend tell a vacation tale, a question can help connect the story to your faith: “Where is God in this story?” I first learned this question from this post on the fabulous Storypath blog. God is in the Bible, of course. But God is also in your story and my story. God is in all kinds of stories (could it be that God is in every story!?). 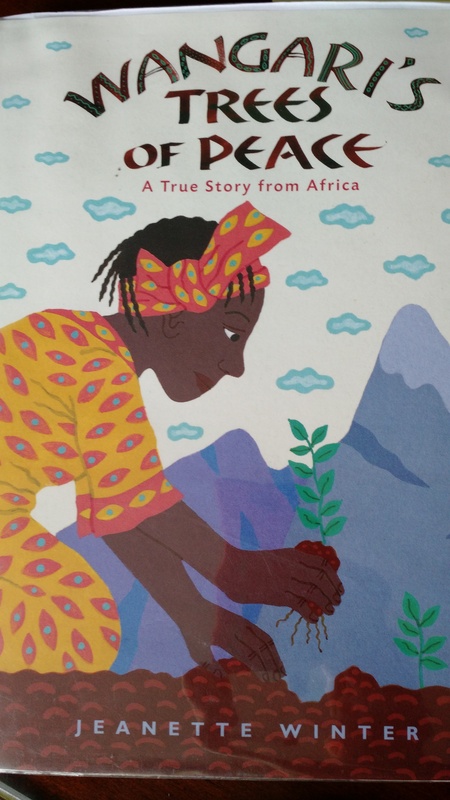 During today’s children’s message, I invited the congregation to consider this question before I shared highlights from Wangari’s Trees of Peace, a picture book by Jeanette Winter. It fit very nicely with the week’s scripture, the Parable of the Mustard Seed, Mark 4:30-32. If you are not familiar with Wangari Maathai, through her efforts, tens of millions of trees were planted in Kenya, replacing many that had been cut down for development. She was the first African woman to win the Nobel Prize for Peace. “The church teaches you that God is omnipresent. If God is omnipresent he can be in Rome and he can be in Kenya at the same time.” Wangari Maathai in On Being. Creator God, thank you for being a part of our story. Help us to pay attention to all the places we find you: in nature, in strength, in helping others and in our own story. Help us to plant seeds of peace, hope, love and joy that can grow into your kingdom. Amen.